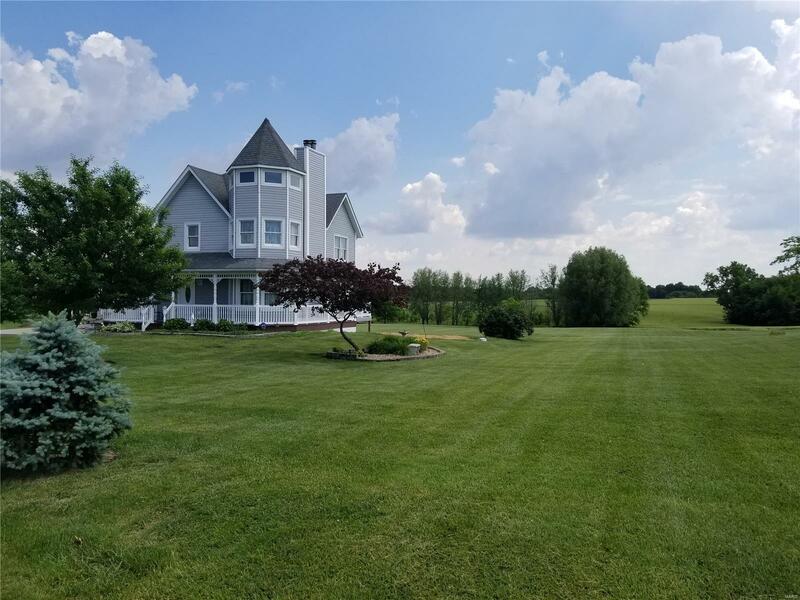 After the beauty and tranquility of the tree lined entrance to Prairie View Estates you will arrive at this Victorian gem with wrap around composite porch and well maintained lush 2.770 acres. The front entryway flows into the living room with gorgeous sitting area and fireplace. The dining and kitchen areas both open to the back composite deck. Off the kitchen you have the main floor laundry. Climbing up the gorgeous oak stairway, you will find the beautiful wood floors in the master bedroom suite with its spiral staircase to the turret full of windows. The master bath has some solid brass fixtures and claw foot tub. The two upstairs bedrooms are generously sized, one hardwood floors and other carpeted, there are walk in closets, and another full bath with yet another claw foot tub. Down the oak stairway to the lower level you will find a large family area with walk out and another gorgeous fireplace as well as a full bath. The whole home has been freshly painted and is MOVE IN READY!